When it comes to industries that are seen as damaging to the environment, the dairy sector is usually the prime target in New Zealand. And there is plenty of evidence to suggest that the production that powers our largest export industry is having an increasingly apparent impact on the land and our waterways. The scale of dairying in New Zealand makes the problem blindingly obvious. Less is heard about the smaller New Zealand beef industry, but beef production actually uses more land, water and greenhouse gases than dairy, as a new study in PNAS revealed this week. The researchers found that producing beef required around 28 times more land than production of eggs, poultry, pork and even dairy, 11 times more water and resulted in five times more greenhouse gas emissions. That’s right, the four categories of production had a similar level of resource use and greenhouse gas production, but beef was way out ahead. 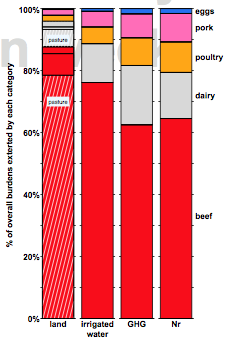 Even when focusing only on agricultural land, beef still towers over the other categories. This can be seen by excluding pasture resources and summing only crops and processed roughage (mostly hay and silage, whose production claims prime agricultural land that can be hypothetically diverted to other crops). After this exclusion, 1 Mcal (megacalorie) of beef still requires ≈15 m2 land, about twofold higher than the second least-efficient category. When you compare beef production to staple crops like rice and wheat that many people depend on for the bulk of their diet in some countries, the picture is more dramatic. Compared to those crops, meat requires 160 times more land and 11 times the water to produce. Here in New Zealand, we don’t have feedlots, though farmers do supplement their cows feed with things like palm kernel, which is quite resource-intensive to produce. 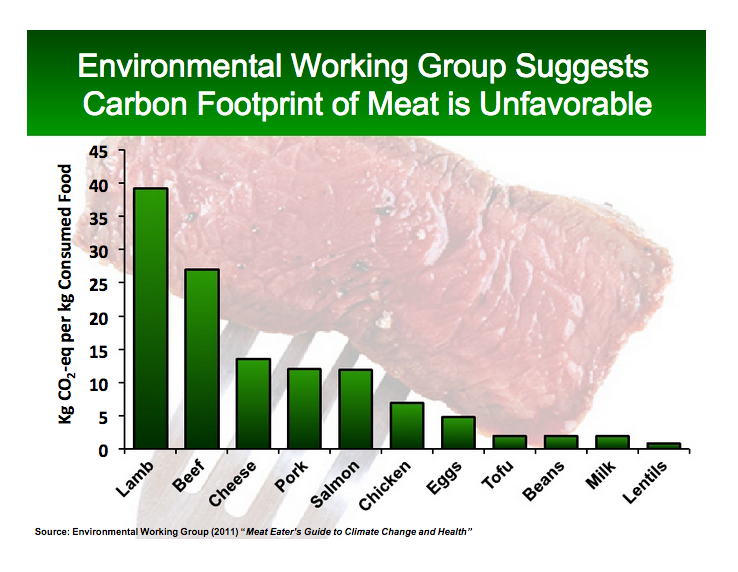 The carbon footprint of grass-fed beef is generally lower than feedlot beef, but the fact remains that beef production is dirtier than anything else, even dairy production in terms of land and water use and greenhouse gases. Therefore, if you want to help the environment, say the authors, cutting down on your beef consumption is one of the most effective things you can do. Animal products in general are quite wasteful of resources compared to edible crops but again, beef i sway out in front. Beef farmers in New Zealand and the US point out that beef yield and efficiency is improving. But beef production will remain more resource-intensive than just about anything else, an issue that will become more important as pressure on land and water increases further. Is this a good time to say that I don’t even like beef all that much? Thanks, Peter, very nice summary. There seems to have been a long cost-advantage to dairy as a source of animal protein. That many ancient human populations who were pastoralists who evolved to retain lactase production is quite suggestive. Dairy is an ecologically cheaper way for humans to acquire a regular source of animal protein- presumably much more reliably and with less effort than meat. In India, beef industry was allowed to expand. Today it is the biggest exporter of beef. Very bad decision indeed. I think that beef, pork (and later Chicken and fisheries) industry have to be withdrawn. There is no way these industries can be sustainable. They are damaging the earth – I hope that the world leaders discussed this in the COP-21 Paris. People should grow trees in places there were cattle farms. More Carbon sink – less pollution – more fruits and more robust global ecosystem. BTW In India – cows and elephants are sacred. Eating meat in general and beef is particular not considered kosher.